Samsung recently introduced another Android smartphone that’s included in its Galaxy Core family, which seems to be getting bigger with each month that passes by. 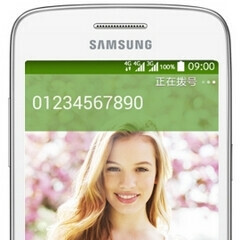 The new handset is called Galaxy Core Mini 4G (model number SM-G3568V), and it’s been officially unveiled in China. Although it features 4G LTE connectivity, the Samsung Galaxy Core Mini is far from being a high-end device. It offers a 4.3-inch display with 480 x 800 pixels, a 5MP rear camera, quad-core 1.2GHz processor, 1.5GB of RAM, and 8GB of expandable internal memory. The smartphone runs Android 4.4 KitKat, weighs 136 grams, and measures 127.8 x 66.2 x 10.6 mm. It seems to have only one color version (that’s white, in case it wasn’t obvious by now). We don’t know if the new Samsung Galaxy Core Mini 4G will be released outside of China, where customers will be able to buy it via China Mobile, but we could see it being successful in other Asian markets - assuming its price isn’t too high. I've given up on Samsung sadly. I also used to have the original note until I got the 2014 edition. Well I was happy until 4 months later the new 12.2 inch was released and I waited 4 more months to get KitKat and I didn't even get stuff added into the new note (wtf Samsung). At least the apple supports even the iPad 2. Samsung just focuses on quantity and pretty much forgets its older devices. I'm currently considering a Surface pro 3 unless of course Apple or Google release a pen input device. even if they did, the 'productivity' of a full OS vs a Mobile OS will show. On the surface 2 i was able to hook up a spare monitor to it, and significantly reduce my desk footprint for a client who needed everything in one. I don't understand why people crib about Samsung releasing a lot of Galaxy Android phones. When you're at the top, you want to stay there. So you release multiple handsets at different price points for different markets and for different people. This is exactly what Samsung is doing. IMO this is a great business tactic. The more phones they release, the more people will buy different handsets and there will be more sales and more profits for Samsung. But consumers often get confused of what phones to buy. If Samsung continues doing this, it's great for them to cover most of the market but at the end of the day it's the consumers who get confused of the amount of Galaxies out there like the Neo, Active, Note, Zoom and Plus. I hope you know they launch specific models for specific countries....dot.